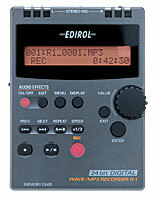 Edirol packs the R-1 with plenty of features for recording on the go. Two omni-directional microphones create a stereo pair for recording audio in 24-bit 44,100 Hz WAV or MP3 formats. External microphones may be connected, as well as additional audio sources via line-in connections. Audio is recorded to Compact Flash, so there's no need to worry about hard disk failure at some crucial point in the recording process. As long as you carry a spare CF card, you never run out of space for more audio. This also provides a great way for recording an interview or performance and then mailing it back to the home office. A microphone simulator makes recordings sound convincingly like a variety of popular microphones (this tool works amazingly well, I've heard samples from other Edirol products). Onboard metronome and tuner features make this a convenient tool for scratch recording by musicians on the go. An additional 12 effects assist in the editing process right on the R-1. Transfer audio via USB 2.0 or listen in a digital environment using S/PDIF output connections. My only complaint is the use of AA batteries instead of some other rechargeable source, but the upside is that carrying extras is much easier than finding a power source when you are on location at a concert hall, doing interviews at a conference or in the field. If you've ever been frustrated by the unidirectional nature of most MiniDisk players or wished your digital recorder had onboard editing for making corrections in the field, this device may be the answer to your audio recording prayers.